Whether you are a nature lover, history buff, or just want to relax on the sand and soak up the sun, Fort Zachary Taylor offers activities for the whole family. The sand on this beach is rocky, but you can snorkel, bird watch, go for scenic bike rides or hike down nature trails. 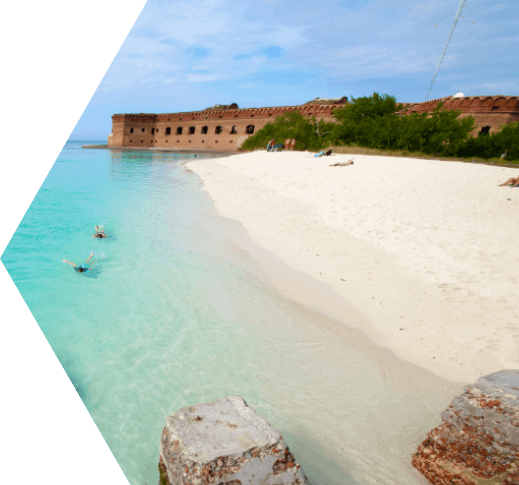 You can also take advantage of this beach’s unique historic fort and take tours as you learn about the Civil War and Fort Zachary Taylor. Fort Zachary Taylor beach has full bathroom facilities, picnic and BBQ grounds, snorkel and kayak rentals, and has snacks and beverages available at the Cay Hueso Café. Located at the end of Duval Street and within walking distance of various restaurants, Key West’s South Beach is a local favorite. Although it is small and has no restroom facilities, South Beach remains one of Key West’s most visited beaches. If you and your dog have made it to Key West, you can’t miss Dog Beach! This beach is a great place to lay back, relax, and watch your dog romp and play on the rocky sand and in the water with his new canine friends. Dog Beach is located at the corner of Vernon and Waddell streets, and has no restroom facilities available. Please help keep Dog Beach clean by picking up after your pet! Located at the end of Reynold’s street, Higg’s Beach is a great place for family fun and is popular among sunbathers. There are playgrounds for the kids, water sports rentals, chair rentals, picnic tables, restrooms and a restaurant available. Admission to the beach is free and it is open daily from 6:00 AM – 11:00 PM. Rest Beach is a popular place to watch the sunset with your family and friends after a day of fun in the water. Here you can relax on the beaches and enjoy the ocean with Key West locals and out-of-towners. Restroom facilities are located just a short walk away and the park is wheelchair accessible. If you love to party, Smathers Beach is the place to go. As Key West’s largest beach, it encompasses a 2 mile stretch of sandy beach and is located just south of Roosevelt Boulevard. There is plenty of parking available for Smathers Beach’s crowds, and there are many activities available. Smathers Beach offers picnic tables, a snorkel swim zone, water sports rentals, parasailing, windsurfing, volleyball, bike paths, snack vendors, and restroom facilities. Bahia Honda State Park beach is located 30 miles north of Key West. Swim, snorkel, enjoy walking on one of the many nature trails or just relax on the pristine white sandy beaches. The 524 acre park is unique to the Keys because of its clear sandy beaches and its expanse of deep waters close enough to shore to offer some of the best swimming and snorkeling opportunities in the Florida Keys.